The timing of the breakdown of red blood cells and organization of hemorrhage has significance in the catabolism of heme and the processing of iron, but also has a practical application in terms of assigning, or attempting to assign, a time course with respect to traumatic events (e.g. contusions and hemorrhages). Attempts to date contusions, however, have generally been unsuccessful by macroscopic observation, whereas the microscopic observations provide broad data but are also anatomically imprecise as a function of time. Intracranial lesions are of particular significance with respect to the timing of organizing hemorrhage given the acute, and often life-threatening nature of the hemorrhages, and the medicolegal investigation into potential crimes. Of concern is that the Prussian Blue reaction for iron, a relatively straightforward histochemical reaction that has been in use for over 150 years, is sometimes suggested as a diagnostic test for chronicity. Therefore, this study examined the utility of the Prussian Blue iron stain in living patients with intracranial hemorrhages and well-defined symptom onset, to test whether the presence of Prussian Blue reactivity could be correlated with chronicity. It was found that out of 12 cases with intracranial hemorrhage, eight cases showed at least focal iron reactivity. The duration from symptom onset to surgery in those eight cases ranged from < 24 hours to more than 3 days. Of those cases with no iron reactivity, the duration from symptom onset to surgery ranged from < 24 hours to six days. In conclusion, the Prussian Blue reaction was unreliable as an indicator of timing in intracranial hemorrhage. The use of the Prussian blue reaction as an independent indicator of chronicity is therefore not valid and can be misleading. Caution is indicated when employing iron staining for timing purposes, as its only use is to highlight, as opposed to identify, pre-existing lesions. With respect to brain lesions, the Prussian blue reaction should not be used in place of the clinical timing of the neurologic decline, or clinical data that is otherwise more accurate and less susceptible to false positive results. Keywords: Hemosiderin, Intracranial hemorrhage, Iron, Prussian blue. The timing of various pathologic and molecular changes associated with organizing hemorrhage is complex and incompletely understood, yet a detailed understanding of those changes is critical and often presumed in medicolegal investigation of traumatic injuries. Of particular interest historically has been the gross assessment of contusions, which show a stepwise progression of color change as a function of time, implicating catabolism of heme and the elaboration of bile, hemosiderin, and hematoidin, and other pigmented byproducts [1Hughes VK, Ellis PS, Burt T, Langlois NE. The practical application of reflectance spectrophotometry for the demonstration of haemoglobin and its degradation in bruises. J Clin Pathol 2004; 57(4): 355-9. [http://dx.doi.org/10.1136/jcp.2003.011445] [PMID: 15047735] ]. Numerous studies, however, have highlighted the subjectivity and lack of accuracy in the gross or clinical assessment of contusions [2Bariciak ED, Plint AC, Gaboury I, Bennett S. Dating of bruises in children: an assessment of physician accuracy. Pediatrics 2003; 112(4): 804-7. [http://dx.doi.org/10.1542/peds.112.4.804] [PMID: 14523170] -8Stephenson T, Bialas Y. Estimation of the age of bruising. Arch Dis Child 1996; 74(1): 53-5. 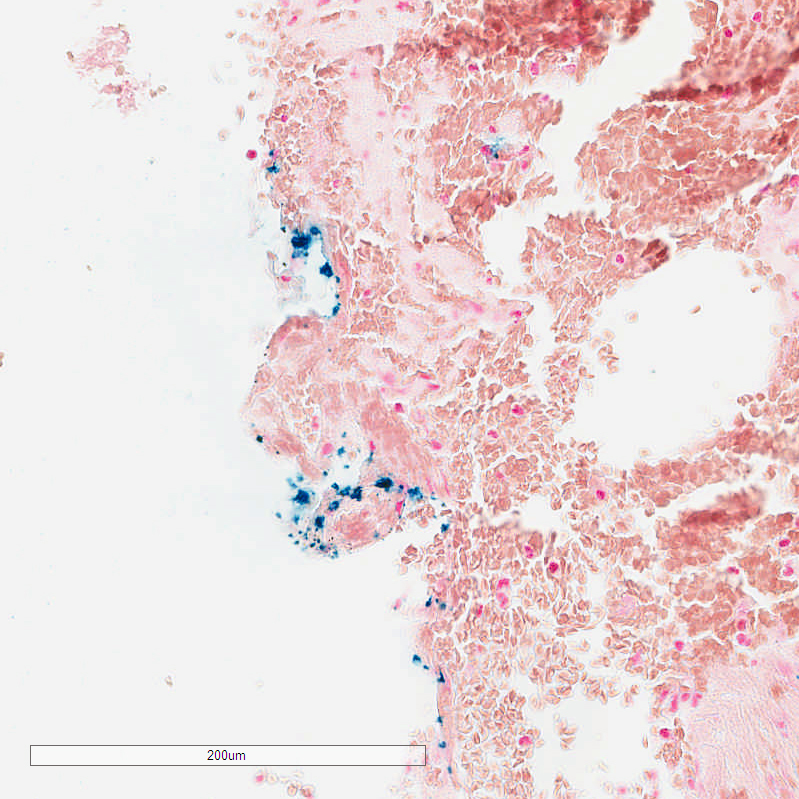 Routine histopathology (H&E with or without Prussian blue stains) offers an additional set of data, in which neutrophilic infiltrates tend to appear within minutes to hours, and hemosiderin after 2 or 3 days, accompanied by macrophages [9Vanezis P. Interpreting bruises at necropsy. J Clin Pathol 2001; 54(5): 348-55. [http://dx.doi.org/10.1136/jcp.54.5.348] [PMID: 11328832] , 10Thornton RN, Jolly RD. The objective interpretation of histopathological data: an application to the ageing of ovine bruises. Forensic Sci Int 1986; 31(4): 225-39. [http://dx.doi.org/10.1016/0379-0738(86)90161-1] [PMID: 3744215] ]. Subsequent vital reactions include granulation tissue formation, chronic inflammatory infiltrates, and fibrosis, among others [11Kumar V, Abbas AK, Aster JC. Inflammation and repair. In: Kumar V, Abbas AK, Aster JC, Eds. Robbins and contran pathologic basis of disease. Elsevier Saunders 2015; pp. 69-112. ], the precision of each in terms of time course between the traumatic event and pathological examination being incompletely defined. Controlled studies in large animals have suggested a progression of cellular infiltrates from neutrophils, to macrophages, to other mesenchymal elements (fibroblasts, endothelial cells) [12McCausland IP, Dougherty R. Histological ageing of bruises in lambs and calves. Aust Vet J 1978; 54(11): 525-7. [http://dx.doi.org/10.1111/j.1751-0813.1978.tb00322.x] ], although even in these carefully controlled settings with the application of a mathematical model, only broad conclusions could be discerned (e.g. less than 20 hours versus 1-3 days) [10Thornton RN, Jolly RD. The objective interpretation of histopathological data: an application to the ageing of ovine bruises. Forensic Sci Int 1986; 31(4): 225-39. Interestingly, assertions of timing are often provided in textbooks as general guidelines, with no actual study supporting the assertion, leading some to conclude that it is not possible to precisely determine the date of contusions, for example [13Dolinak D, Matshes E. Blunt Force Injury. In: Dolinak D, Matshes E, Lew E, Eds. Forensic Pathology Principles and Practice. Elsevier Academic Press 2005; p. 128.]. As such, the idea that hemosiderin appears in 2 or 3 days, may be interpreted, in an overly concrete fashion, as somewhere between 48-72 hours. This may lead to a mischaracterization of timing of a traumatic event, when the reality is that both shorter and longer time intervals have not been excluded and indeed may be likely based on the clinical data. The Prussian blue reaction is sometimes suggested as something of an a priori indicator of timing, albeit with no supporting evidence. Such an approach, which often surfaces in the forensic investigation of potential criminal acts, necessarily ignores the possibility that stainable iron may be present within a pre-existing lesion, or within incidental siderophages that may be encountered anywhere in the human body. 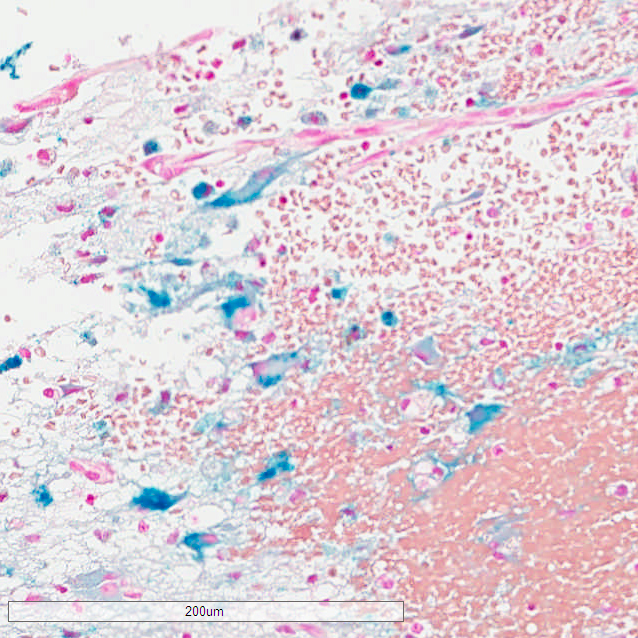 Moreover, the use of the iron stain independent of routine histopathology and clinical data also raises the possibility of misinterpreting falsely positive staining artifacts. The adversarial setting in which such assessments are made and such opinions offered, only add to the confirmation bias and likelihood of an erroneous interpretation. In this study, we tested the utility of iron stain in unselected intracerebral hemorrhages presenting for surgical evacuation at the University of Maryland Shock Trauma center. Clinical data obtained from the medical records included the specific time course from the onset of symptoms to surgery, indicating unambiguously the timing of the clinically meaningful process. The results indicate that iron stain is of no value in the timing assessment of unselected brain hemorrhages, and may in fact be misleading. More research is needed in this area, with greater attention paid to the basic pathological alterations, the clinical data available, and the variations of normal. Blood clots were obtained at surgery in 12 unselected patients presenting with acute neurological signs, in whom blood clot was submitted for pathological examination. A summary of the patient data is presented in Table 1. The patients’ ages ranged from 38 to 93. There were 7 men and 5 women. The etiologies of the hemorrhages included hypertensive hemorrhage (three cases), complication of coagulopathy (three cases), trauma (two cases), complication of previous surgery (one case), probable septic embolus (one case), AV fistula (one case), pseudoaneurysm (one case), and metastatic carcinoma (one case). A summary of the patient data. Representative blood clot obtained at surgery was fixed in 10% neutral buffered formalin. Post-fixed tissue was dehydrated in graded ethanol and xylene solutions, and embedded in paraffin. 5 µm thick microtome sections were prepared. Routine hematoxylin and eosin stains were performed. Prussian Blue special stain was performed on formalin-fixed, paraffin embedded tissues on all 12 cases with Iron Flex v1© standard procedure. Tissue was deparaffinized and hydrated with distilled water, immersed in 20% aqueous hydrochloric acid (Iron Reagent A) for 4 minutes, then aqueous potassium ferrocyanide (Iron Reagent B) for 4 minutes. Tissue was then rinsed with distilled water and immersed in 0.1% Nuclear Fast Red Solution for 4-5 minutes, then re-rinsed. Tissue then underwent two changes of 95% alcohol, 100% alcohol, and xylene, respectively, before being coverslipped. (Gomori, G. “Gomori’s Method for Iron”. Ameri. J Path. 12:655-663. 1936.) Special stain controls were prepared in the laboratory with liver and spleen tissue and run with each case. Protein bound ferric iron pigment stains bright blue. Microscopic examination showed clotted blood with early organization in all cases. In one case, metastatic carcinoma was evident, within the stroma of which was hemosiderin pigment which reacted positively with the iron stain. In another case, a subdural neomembrane was evident, and contained significant stainable iron, although both the neomembrane and the iron pigment were apparent on routine H&E staining. The remaining cases showed clotted blood only, on H&E stained sections. A positive staining reaction with Prussian blue was nevertheless variably present in these cases with only clotted blood on H&E stained sections, varying from no reaction to readily detectable reaction. Of the 12 cases, eight showed iron positivity ranging from isolated collections of blue staining, to multifocal reactivity (Figs. 1 -3 ). The presence of iron detected by iron staining was most abundant in those cases with a pre-existing lesion (metastatic carcinoma, neomembrane), although the iron stain could not be said to have been useful in diagnosing those lesions, as both were readily apparent on H&E stained sections. Four cases showed no iron staining at all. Prussian blue stain of an acute intracerebral hemorrhage, in a 44 year old woman who presented acutely with probable mycotic aneurysm rupture. Focal iron positivity is noted. Scale bar = 200 µm. Iron staining offered no timing information. Specifically, of the eight cases with at least focal iron reactivity, the duration from symptom onset to surgery ranged from < 24 hours to more than 3 days. Of those cases with no iron reactivity, the duration from symptom onset to surgery ranged from < 24 hours to six days. Prussian blue stain of an acute subdural hematoma in a 51 year old man. There was no neomembrane pathologically, and no evidence of a mixed density hematoma on imaging (blood was entirely acute). Nevertheless, focal iron positive was present, likely representing pre-existing siderophages in the leptomeninges. Surgical evacuation was performed less than 24 hours following a fall. Acute on chronic subdural hemorrhage in a 93 year old man who presented acutely after a fall. 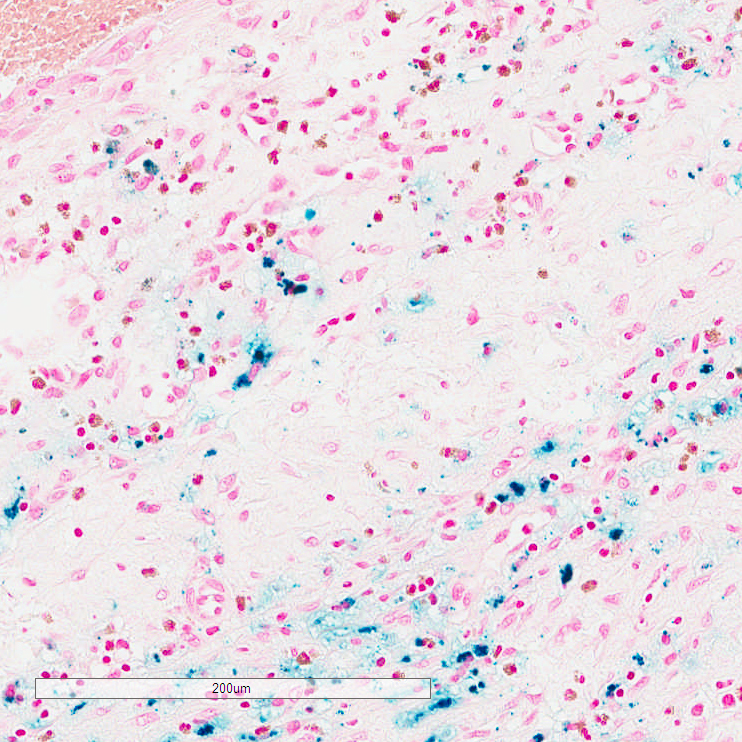 A pre-existing neomembrane and hemosiderin granules were present on routine histopathology, precluding the need for an iron stain. In this study, we examined consecutive intracranial hemorrhage specimens obtained at surgery, to assess whether histopathological examination along with iron staining offered any information as regards timing of the clinically significant hemorrhagic event. The most remarkable finding was the presence of Prussian blue-stainable iron within hemorrhages in 8 out of 12 cases. Of the 8 positive cases, 4 had a total duration of onset of neurologic signs to surgical evacuation of less than 24 hours. The iron collections in the eight positive cases ranged from focal reactivity to multifocal deposits. Moreover, in four cases with iron positivity and a clinical duration of less than 24 hours, none had a pre-existing or underlying lesion that could account for the presence of remote hemorrhage. Whether this represents an incidental hemosiderin deposit that predated the clinical process, or an unrecognized and pre-existing structural pathology is unclear, although it should be pointed out that hemosiderin deposits detectable by magnetic resonance imaging (MRI) may occur in the absence of clinically significant remote hemorrhage [14De Reuck J, Auger F, Cordonnier C, et al. Comparison of 7.0-T T2*-magnetic resonance imaging of cerebral bleeds in post-mortem brain sections of Alzheimer patients with their neuropathological correlates. Cerebrovasc Dis 2011; 31(5): 511-7. On a prospective basis, while histological examination offers the opportunity to identify an underlying lesion (e.g. neomembrane, vascular malformation, tumor), iron stain adds nothing to the assessment apart from routine pathology. On the contrary, the most remarkable aspect of the employment of the iron stain as a putative marker of chronicity is that the iron stain was, more often than not, misleading. These findings have broad implications in the pathological assessment of hemorrhage in the medicolegal setting: specifically that i) clinical signs are the most informative piece of information for accurately assessing timing during the course of acute events; ii) routine histopathology may identify a pre-existing lesion; iii) iron staining is not useful as an independent diagnostic test for chronicity. Thus, in the absence of reliable clinical information, iron staining should be performed with caution, if at all, if the goal is to establish a timeline for a given pathological process. The lack of utility of iron staining in the assessment of chronicity does not preclude modern modalities that may better characterize the molecular events associated with the breakdown of red blood cells. MRI examination, for example, demonstrates differing signal changes as a function of hematoma age and the type of MR contrast (i.e., T1 weighted or T2 weighted), with five distinct stages identified: hyperacute (intracellular oxyhemoglobin, long T1 and T2), acute (intracellular deoxyhemoglobin, long T1, short T2), early subacute (intracellular methemoglobin, short T1, short T2), late subacute (extracellular methemoglobin, short T1, long T2), and chronic (ferritin and hemosiderin, short T2) [15Bradley WG Jr. MR appearance of hemorrhage in the brain. Radiology 1993; 189(1): 15-26. [http://dx.doi.org/10.1148/radiology.189.1.8372185] [PMID: 8372185] ]. In another study, application of reflectance spectrophotometry showed some promise in assessing human bruises over time, and determined that the yellow color in bruises over time was due to the local breakdown of hemoglobin [1Hughes VK, Ellis PS, Burt T, Langlois NE. The practical application of reflectance spectrophotometry for the demonstration of haemoglobin and its degradation in bruises. J Clin Pathol 2004; 57(4): 355-9. [http://dx.doi.org/10.1136/jcp.2003.011445] [PMID: 15047735] ]. Precise timing of hemoglobin breakdown, however, was not indicated. Enzymatic degradation of heme offers another potential avenue of assessing localized blood accumulations in a temporal fashion. The rate limiting step of heme breakdown in tissues is catabolized by heme oxygenase enzymes, which consists of inducible heme oxygenase-1, and constitutively expressed heme oxygenase-2 [16Premkumar DR, Smith MA, Richey PL, et al. Induction of heme oxygenase-1 mRNA and protein in neocortex and cerebral vessels in Alzheimers disease. J Neurochem 1995; 65(3): 1399-402. [http://dx.doi.org/10.1046/j.1471-4159.1995.65031399.x] [PMID: 7543935] ]. Thus, a change in heme oxygenase-1 expression in tissues could theoretically assign a time course for heme breakdown. As yet, precise timing data for heme oxygenase-1 upregulation, are not available. Nevertheless, the above methodologies are a technological advance over the Perl’s Prussian Blue reaction, which is 19th century histochemical technology. It is noteworthy that the patients in this series ranged from age 39 to 93 years of age. This raises the possibility that local accumulation of hemosiderin over time contributed to the high frequency of observable iron reactivity. The increase in iron in various brain regions as a function of age is well known from MRI studies, which have shown correlation with iron as identified by the Prussian blue reaction [17Dusek P, Dezortova M, Wuerfel J. Imaging of iron. Int Rev Neurobiol 2013; 110: 195-239. [http://dx.doi.org/10.1016/B978-0-12-410502-7.00010-7] [PMID: 24209440] -19Tanaka A, Ueno Y, Nakayama Y, Takano K, Takebayashi S. Small chronic hemorrhages and ischemic lesions in association with spontaneous intracerebral hematomas. Stroke 1999; 30(8): 1637-42. [http://dx.doi.org/10.1161/01.STR.30.8.1637] [PMID: 10436114] ]. Interestingly, MRI assessment is sensitive enough to detect small collections of hemosiderin unrelated to old hemorrhages [14De Reuck J, Auger F, Cordonnier C, et al. Comparison of 7.0-T T2*-magnetic resonance imaging of cerebral bleeds in post-mortem brain sections of Alzheimer patients with their neuropathological correlates. Cerebrovasc Dis 2011; 31(5): 511-7. [http://dx.doi.org/10.1159/000324391] [PMID: 21422755] ], clearly indicating that microscopic collections of hemosiderin are an incidental and expected finding. In view of these data, it is not surprising that small collections of Prussian blue positive material would be present in lesions that are otherwise acute and indeed unrelated to those hemosiderin collections. Moreover, the presence of incidental collections of iron is a known occurrence even in infancy. In the only study to date that examined pediatric dura mater, the presence of iron in grossly unremarkable dura, even in infants, is neither unexpected nor infrequent [20Croft PR, Reichard RR. Microscopic examination of grossly unremarkable pediatric dura mater. Am J Forensic Med Pathol 2009; 30(1): 10-3. [Internet]. [http://dx.doi.org/10.1097/PAF.0b013e31818737be] [PMID: 19237845] ]. It is likely, therefore, that even in the case of pediatric intracerebral hemorrhage, incidental accumulations of iron is an expected finding in a subset of cases, as it is in adult cases as described in this study. Among the more contentious aspects of dating of intracranial hemorrhage relates to the assessment of subdural collections with respect to pediatric head trauma. In this group, it is often asserted that the presence of subdural iron and/or a subdural neomembrane is evidence of a previous injury which, when present, predisposes to subsequent injury with lesser degrees of trauma. This assertion is in reality an extrapolation from adult subdural hemorrhage that is inapplicable to infants. In the adult scenario (often older adults with coagulopathies, atrophic brains, and fragile bridging veins) head trauma may result in arachnoidal tears and subsequent subdural hygromas, or an organizing neomembrane that itself may be prone to “rebleeding” [21Case ME. Abusive head injuries in infants and young children. Leg Med (Tokyo) 2007; 9(2): 83-7. [http://dx.doi.org/10.1016/j.legalmed.2006.11.017] [PMID: 17276126] ]. The role of such a process in the pediatric population, or genuine chronic subdural hematoma resulting in neurologic deterioration or death, on the basis of the literature to date, is non-existent. Only three cases of possible expansion of subdural collections has been reported in the literature in infants [22Hymel KP, Jenny C, Block RW. Intracranial hemorrhage and rebleeding in suspected victims of abusive head trauma: addressing the forensic controversies. Child Maltreat 2002; 7(4): 329-48. [http://dx.doi.org/10.1177/107755902237263] [PMID: 12408245] -24Inoue H, Hyodoh H, Watanabe S, Okazaki S, Mizuo K. Acute enlargement of subdural hygroma due to subdural hemorrhage in a victim of child abuse. Leg Med (Tokyo) 2015; 17(2): 116-9. [http://dx.doi.org/10.1016/j.legalmed.2014.10.006] [PMID: 25457269] ]; two of those cases were asymptomatic and had a benign clinical course, and the chronic subdural collections in those cases were both likely precipitated by inflicted (abusive) injuries [22Hymel KP, Jenny C, Block RW. Intracranial hemorrhage and rebleeding in suspected victims of abusive head trauma: addressing the forensic controversies. Child Maltreat 2002; 7(4): 329-48. [http://dx.doi.org/10.1177/107755902237263] [PMID: 12408245] , 23Wuerfel nee Tysiak E, Petersen D, Gottschalk S, Gerling I, Gliemroth J, Thyen U. Progression of chronic subdural haematomas in an infant boy after abusive head trauma. Eur J Paediatr Neurol 2012; 16(6): 736-9. [http://dx.doi.org/10.1016/j.ejpn.2012.02.006] [PMID: 22421521] ]. The third case was a child abuse death, in which the expansion of a hygroma was inferred by the presence of a neomembrane [24Inoue H, Hyodoh H, Watanabe S, Okazaki S, Mizuo K. Acute enlargement of subdural hygroma due to subdural hemorrhage in a victim of child abuse. Leg Med (Tokyo) 2015; 17(2): 116-9. [http://dx.doi.org/10.1016/j.legalmed.2014.10.006] [PMID: 25457269] ]. Whether there was a sizeable subdural collection prior to death is unclear. Importantly, a verified, accidental etiology for a chronic subdural collection, followed by a subsequent, more trivial injury and acute bleeding (acute on chronic subdural hematoma), resulting in collapse and death of an infant, has never been reported, and it is likely a pathophysiological impossibility in this age group. 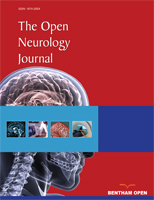 The overriding significance of the present study is that a copious search for iron or evidence of remote, microscopic subdural blood or a focal, thin neomembrane, would have no bearing on etiology or severity of acute subdural hemorrhage in the setting of pediatric head trauma, since small collections of iron and even thin, small neomembranes may be found incidentally at any age. Another study examined the role of macrophages and iron in the timing of the subdural hematoma. In this study, MHC class II expression was upregulated within 24 hours of injury, and CD68 expression detected 24-48 hours after injury. Further, there was a significant and positive association between the expression of MHC class II immunohistochemistry or CD68 antigens and the progressive survival of subdural hematoma for 31 days following injury, which was not seen with Prussian blue staining [25Al-Sarraj S, Mohamed S, Kibble M, Rezaie P. Subdural hematoma (SDH): assessment of macrophage reactivity within the dura mater and underlying hematoma. Clin Neuropathol 2004; 23(2): 62-75. [PMID: 15074580] ]. In short, immunohistochemistry had some marginal value in terms of timing assessment, while the Prussian blue iron stain was unhelpful. The current study has the obvious limitation of overall number of cases, and efforts in our Center are ongoing to collect additional cases, with broader age ranges and a greater diversity of pathological processes, including more trauma cases. Nevertheless, the results from this relatively small number demonstrate a clear difference between an ancillary technique used to “highlight” a change that is otherwise perceptible by routine light microscopy, and a genuine diagnostic test that provides information independent of clinical data. Another limitation of this study is that whereas the timing of the clinical process was reasonably clear from the abrupt onset of neurological signs, information is limited with respect to pre-existing structural pathology. Further studies with more cases that have additionally characterized disease processes may help clarify this issue. Pathological assessment of timing of traumatic events is fraught with error. The significant inter-individual variation, the lack of precision of gross and microscopic changes, and the primitive nature of the techniques in general use (gross observation, histopathology, special stains), all suggest caution when attempting to assign a time interval between a hemorrhagic lesion and presentation or death. Noteworthy from this study is that the Prussian Blue reaction for iron is not only useless as an independent indicator of timing, but may be misleading, as both positive and negative reactions may be observed at various time points. Hughes VK, Ellis PS, Burt T, Langlois NE. The practical application of reflectance spectrophotometry for the demonstration of haemoglobin and its degradation in bruises. J Clin Pathol 2004; 57(4): 355-9. Bariciak ED, Plint AC, Gaboury I, Bennett S. Dating of bruises in children: an assessment of physician accuracy. Pediatrics 2003; 112(4): 804-7. Harris TS. Bruises in children: normal or child abuse? J Pediatr Health Care 2010; 24(4): 216-21. Maguire S, Mann MK, Sibert J, Kemp A. Can you age bruises accurately in children? A systematic review. Arch Dis Child 2005; 90(2): 187-9. Stam B, van Gemert MJ, van Leeuwen TG, Teeuw AH, van der Wal AC, Aalders MC. Can color inhomogeneity of bruises be used to establish their age? J Biophotonics 2011; 4(10): 759-67. Sugar NF, Taylor J A, Feldman KW, Deangelis CD. Bruises in infants and toddlers. Arch Pediatr Adolesc Med 1999; 153: 399-403. Langlois NE, Gresham GA. The ageing of bruises: a review and study of the colour changes with time. Forensic Sci Int 1991; 50(2): 227-38. Stephenson T, Bialas Y. Estimation of the age of bruising. Arch Dis Child 1996; 74(1): 53-5. Vanezis P. Interpreting bruises at necropsy. J Clin Pathol 2001; 54(5): 348-55. Thornton RN, Jolly RD. The objective interpretation of histopathological data: an application to the ageing of ovine bruises. Forensic Sci Int 1986; 31(4): 225-39. Kumar V, Abbas AK, Aster JC. Inflammation and repair. In: Kumar V, Abbas AK, Aster JC, Eds. Robbins and contran pathologic basis of disease. Elsevier Saunders 2015; pp. 69-112. McCausland IP, Dougherty R. Histological ageing of bruises in lambs and calves. Aust Vet J 1978; 54(11): 525-7. Dolinak D, Matshes E. Blunt Force Injury. In: Dolinak D, Matshes E, Lew E, Eds. Forensic Pathology Principles and Practice. Elsevier Academic Press 2005; p. 128. De Reuck J, Auger F, Cordonnier C, et al. Comparison of 7.0-T T2*-magnetic resonance imaging of cerebral bleeds in post-mortem brain sections of Alzheimer patients with their neuropathological correlates. Cerebrovasc Dis 2011; 31(5): 511-7. Bradley WG Jr. MR appearance of hemorrhage in the brain. Radiology 1993; 189(1): 15-26. Premkumar DR, Smith MA, Richey PL, et al. Induction of heme oxygenase-1 mRNA and protein in neocortex and cerebral vessels in Alzheimers disease. J Neurochem 1995; 65(3): 1399-402. Dusek P, Dezortova M, Wuerfel J. Imaging of iron. Int Rev Neurobiol 2013; 110: 195-239. Walsh AJ, Lebel RM, Eissa A, et al. Multiple sclerosis: validation of MR imaging for quantification and detection of iron. Radiology 2013; 267(2): 531-42. Tanaka A, Ueno Y, Nakayama Y, Takano K, Takebayashi S. Small chronic hemorrhages and ischemic lesions in association with spontaneous intracerebral hematomas. Stroke 1999; 30(8): 1637-42. Croft PR, Reichard RR. Microscopic examination of grossly unremarkable pediatric dura mater. Am J Forensic Med Pathol 2009; 30(1): 10-3. [Internet]. Case ME. Abusive head injuries in infants and young children. Leg Med (Tokyo) 2007; 9(2): 83-7. Hymel KP, Jenny C, Block RW. Intracranial hemorrhage and rebleeding in suspected victims of abusive head trauma: addressing the forensic controversies. Child Maltreat 2002; 7(4): 329-48. Wuerfel nee Tysiak E, Petersen D, Gottschalk S, Gerling I, Gliemroth J, Thyen U. Progression of chronic subdural haematomas in an infant boy after abusive head trauma. Eur J Paediatr Neurol 2012; 16(6): 736-9. Inoue H, Hyodoh H, Watanabe S, Okazaki S, Mizuo K. Acute enlargement of subdural hygroma due to subdural hemorrhage in a victim of child abuse. Leg Med (Tokyo) 2015; 17(2): 116-9. Al-Sarraj S, Mohamed S, Kibble M, Rezaie P. Subdural hematoma (SDH): assessment of macrophage reactivity within the dura mater and underlying hematoma. Clin Neuropathol 2004; 23(2): 62-75.